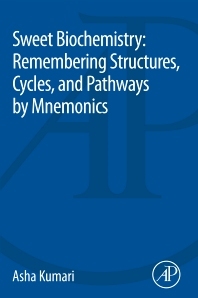 Sweet Biochemistry: Remembering Structures, Cycles, and Pathways by Mnemonics makes biochemistry lively, interesting and memorable. by connecting objects, images and stories. Dr. Kumari has converted cycles and difficult pathways into very simple formula, very short stories and images which will help readers see familiar things in complicated cycles and better visualize biochemistry. Dr. Asha Kumari is a young medical biochemist. Her parent institute is Pt. BD Sharma, PGIMS, Rohtak, from where she completed her MBBS and MD Biochemistry in 2014. She is presently working as a demonstrator in the Department of Biochemistry of the same prestigious institute. She is a member of Association of Medical Biochemists of India. She is actively involved in medical research and has written papers in international and national journals. She is second child of Sh. Dayanand and Smt. Burfo Devi. Her elder and younger brother has always encouraged her talents. Personally, she is versatile. A good dancer, painter, singer and a sportwomen. Her native place is Rohtak, Haryana, India. She believes that ‘science is religion and religion is science’. Dr. Asha has a deep interest in improving the teaching methods in medical field. This book is her first endeavor in the same direction. The book is really great especially in learning the concepts & terms very fast & for long time. Thanx to the author to write such a knowledge source.